Dinan has been tweaking and customizing BMWs for years and the latest BMW to get the Dinan treatment is the M4. 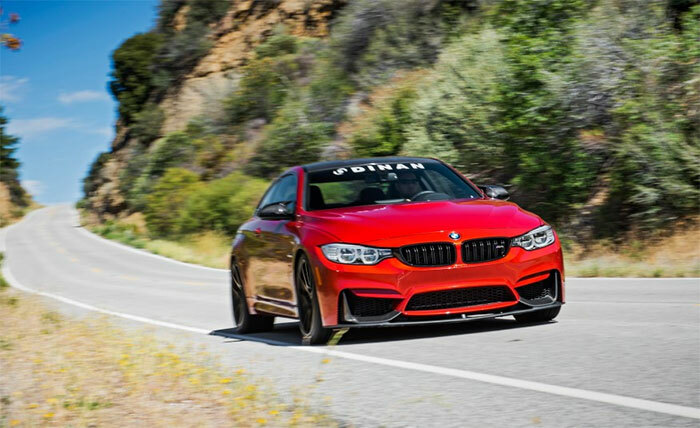 In Dinan trim it’s called the S1 M4 and it packs 530hp under the hood. The big thing here is that this particular car isn’t as made over as some previous Dinan models. Rather than gutting the engine and starting from scratch, the car has $7247 in engine mods. Those mods include a DinanTronics signal conditioner, free flowing muffler, and carbon fiber cold air intake. Those tweaks don’t sound like much, but they add up to another 105hp and 98 lb-ft of torque. The Dinan mods carry a warranty that protects the car for four years and 50,000 miles. The mods push the car from zero to 60mph in 3.8 seconds, surprisingly slower than the stock M4 car and Driver tested last year. The reason Dinan says is that the M4 is underrated from the factory making real gains on their in house dyno more like 46hp and 58 lb-ft of torque. Upgraded suspension helps the car in the corners. The car can pull 0.97g on the skidpad.